I live in Ventura, California within sight of the gorgeous Channel Islands. To visit them is like going to another world. Flora and Fauna presents itself in unusual ways. The Channel Island Fox represents the only carnivore unique to California. These creatures fascinated me and as I was writing Shimji, The Channel Island Vixen, this fox took on a life of its own. Shimji, the Channel Island Vixen is an adventurous children’s book written by Christina Steiner. After hearing so many tales of her ancestors, Shimji, a young fox kit, decides to explore the world and see what it has to offer. Knowing that water vessels travel between the islands and the mainland regularly, Shimji sneaks onto a ferry and makes it across, but has no idea where to go or what to do. She meets many different animals on her travels, but after being chased across town by angry dogs, Shimji finds herself befriending a cat and his human family. While trying to assist Shimji in returning to her island home, the family quickly discovers that Shimji would be taken by the government to a zoo instead. This causes Shimji to put all of her efforts, survival skills and cunning into trying to find a way back to the island on her own. Positively engrossed in every word I read, I found that Christina Steiner’s story about a young fox named Shimji not only presented a wonderful, exploratory adventure of an animal eager to see the world, but also showed how different animal species interact, regardless of their difference in size or habitat, while helping each other escape the perils of various predators. Learning which foods and animals to avoid, Shimji is able to make her way across the treacherous sea and onto the mainland, where she finds new species of animals and is able to determine for herself whether or not they can be trusted. From sea lions, seagulls, possums, horses, cats and even skunks, Shimji has an incredible tale to tell, should she ever find her way back home. Each animal interaction left me smiling, with the exception of those with an evil motive in mind, and I found myself cheering Shimji on the whole way, while easily visualizing each interaction with each turn of the page. 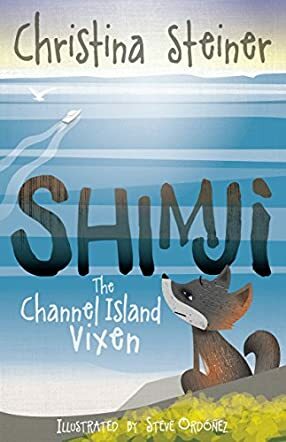 I thoroughly enjoyed Shimji, the Channel Island Vixen, and recommend it to readers aged 7-14 years of age, who enjoy books about various species of animals interacting in a peaceful, almost humanlike way. I look forward to reading more books from Christina Steiner in the future.